For a number of years I was convinced of the superiority of laptops. But finally the cramped typing and viewing made me reconsider. The keyboard is a Logitech Ultra Flat Keyboard and I naively thought there wouldn’t be too much different amongst keyboards, but that was before I realised some people might think it was a good idea to A) remove the empty area above the arrow keys, and B) move the page up/page down to the bottom row, and C) move the home/end above the numpad. 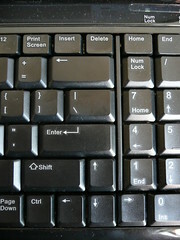 Being able to find the arrow keys by feeling the empty space is a very useful part of psuedo-touch typing. Not sure if I will get used to it or if this keyboard will need to be moved-on. 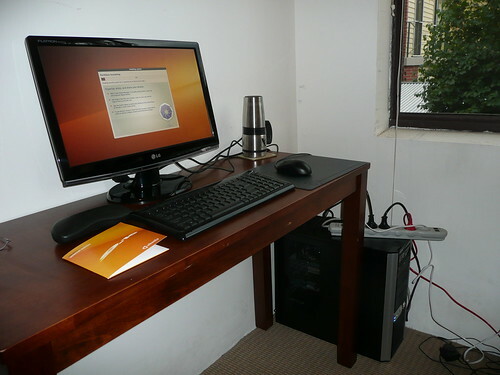 The monitor is an LG Flatron W2053TQ, 20inch widescreen. It’s very nice; nice standard 16:9 ratio, and I can use it in a room with natural light coming in (not overly reflective, unlike my laptop). My desk is pretty narrow so anything bigger would be too big I think. It tilts back and forward but doesn’t move up and down. The controls are OK by me; I can swipe across the power without tilting the whole screen (unlike my Samsung monitor at work), but apparently not everyone agrees. Under the “fun” option it can even display in 4:3, which I never thought would be useful, until I tried to install Ubuntu 9.04 and it didn’t recognise my monitor! At least putting it in 4:3 meant I could read stuff without getting a headache. More on that in a minute. 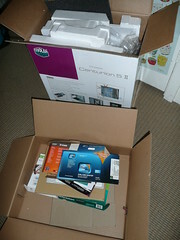 So I got all this and eagerly plugged it in and set about installing Ubuntu 9.10. I happen to have install disks for both 9.10 and 9.04 available. My laptop is still running Xubuntu 8.04 and while I thought at the time sticking to LTS releases would save me work, I think it only delayed it, so I now plan to upgrade progressively as releases come out. So I popped in the install disk and went click-click-click, and it all seemed to go swimmingly. Until I logged in, and within seconds, the keyboard and mouse would stop responding. and then ran sudo update-grub. This meant I could login to the GUI without a freezing mouse and keyboard, and I could check that the screen resolution looked fine and the wireless worked (two Linux bugbears of mine). OK. So now all I needed to do was update the kernel and I could restore that ACPI setting, and all would be good. Luckily the next day internets were flowing much more freely, and I easily updated to kernel 2.6.31-19 (from -14). Rebooting gave me a new error about failing to contact the configuration server something-something gconf daemon. Sounds bad, but some more Googling showed there was an easy fix: delete some ~/.blah settings. OK. Ready to go. All should be good. Except…the freezing returns. When I edit the grub commands explicitly, the “quiet splash” is still there, and the “acpi-off” is not, so it seems it is not reading my instructions, or something. So more work is needed, but I at least feel confident enough to start installing my extra packages and copying over my data. No one makes keyboards with a standard layout anymore. They all need to be Special in the own Special way. I guess it had something to do with venduh lockin – you can never buy anything other than a SomeCrappyKorp keyboard anymore because you’re used to our Special layout.